After being one of the most successful operating systems in the past one decade, Microsoft now wants you to say goodbye to Windows 7, but in a polite way. To make this happen, the company will soon start notifying its existing users about ‘end of support’ which is dated to occur at January 14th, 2020. So in case, if you are using Windows 7 and you get the similar notification, it would be better to start planning for an upgrade to Windows 10 as once the due date gets over, you will no longer receive the necessary updates to make your windows work better. Microsoft has played really safe. 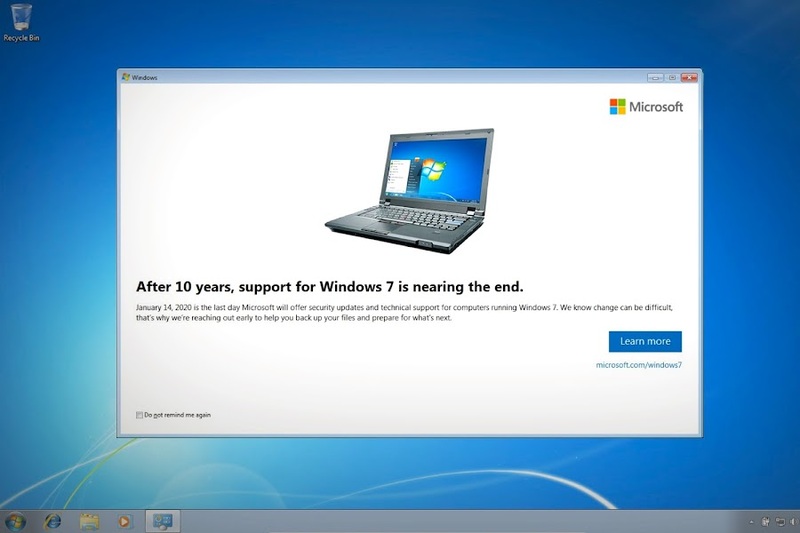 The notification doesn’t mention Windows 10 directly, instead it provides the link of new Windows 7 page that will guide users to upgrading their PC, hence being the ultimate solution. Furthermore, the notification box will only appear for a ‘handful times’ in 2019. You can also click on the given “do not remind again” option to stop receiving the reminder. It looks like a well thought out plan to encourage users for Windows 10, especially in response to the previous attempts by Microsoft, in which they tried to send bold notifications to users that contained a repeated message of updating to Windows 10. The results turned out to be extremely negative only because people were still comfortable with how their PCs were working. In another news, Windows 10 has recently passed 7’s market share and it is running on more than 800 million devices worldwide. But Microsoft still aims to get Windows 10 installed on 1 Billion devices. If all goes well, who knows, this upgrade cycle notification might just turn out to be the final push that Microsoft needs to set the record.